Our bulbs are shipped in cartons of 25 bulbs or in cases of 1000 - so they can only be ordered multiples of those quantities. Don't forget to purchase a C9 cord if you don't have one already. Our C9 stringer wire are available in 25, 50, 100. and 1000 foot lengths are available on our C9 Cords page. 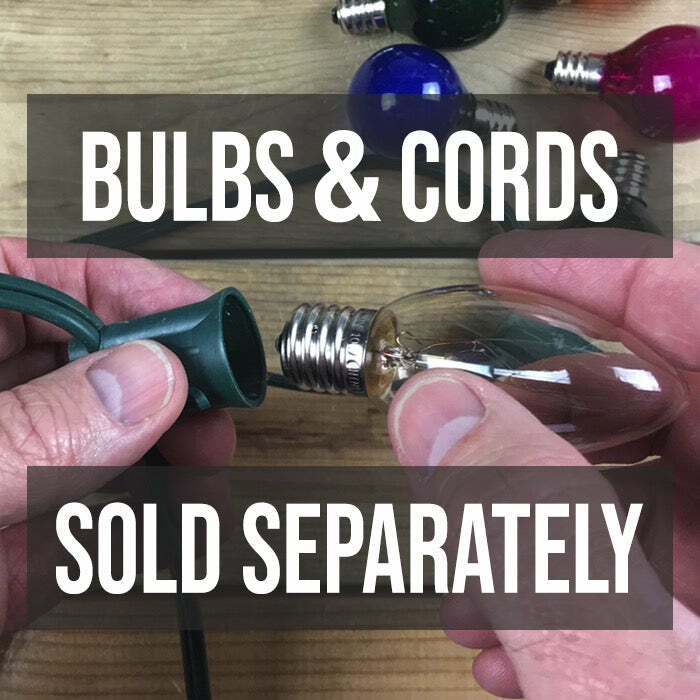 Purchasing bulbs and cords separately gives you complete freedom when it comes to mixing colors of lights in any order that you like. 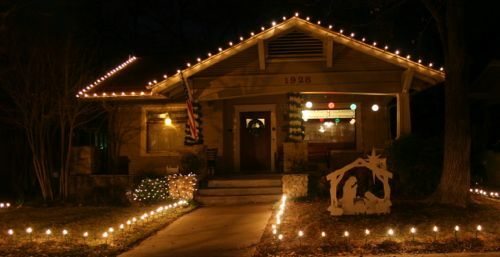 What type of lighting do you think will make the biggest impression this Christmas? The bright glow of our transparent or clear C9 bulbs is second to none when it comes to making your lighting application absolutely sparkle. These bulbs are the most classic bulbs used during the season. If you're driving down the street of a residential neighborhood or even the streets of a local town, there is a good chance you have seen transparent C9 bulbs in action. They're a favorite among professionals everywhere for turning what would have been a ho-hum lighting display into a stunning one. These 2-inch clear Christmas bulbs shine brilliantly and are ideal for larger and more expansive lighting projects. even your urban chicken coop! White C9 bulbs are also great for highlighting your windows and doors from the outside. 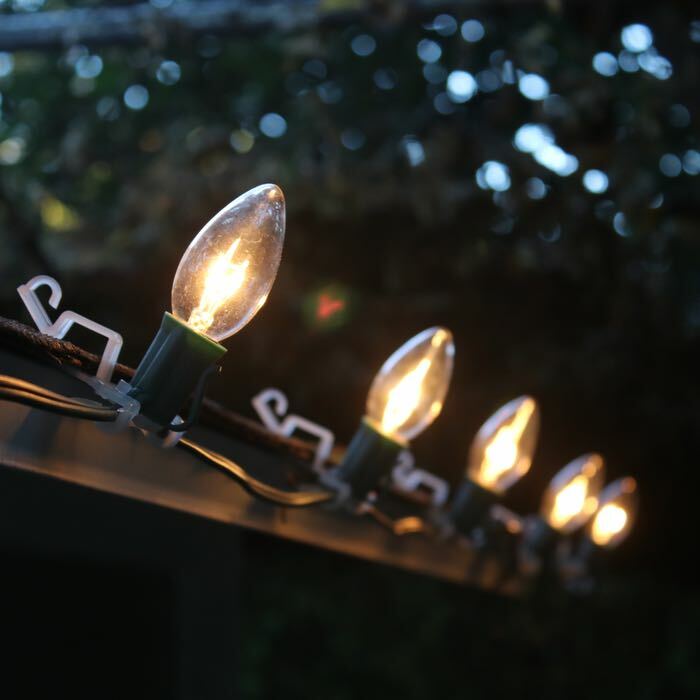 Shrubs, trees, and fences will sparkle too when adorned with these beautiful Christmas light bulbs. Commercial lighting projects will garner attention for your business location or to the center of town when our transparent C9 bulbs are used. At a full 7 watts per bulb, they have a visual punch. Do not nestle these bulbs into plastic tree limbs. Some of the latest models of plastic Christmas trees have super-thin plastic needles that will melt with extended contact with incandescent C7 or C9 bulbs. There's nothing like C9 incandescent bulbs. These bulbs are well made and durable. I purchased 5 boxes and NOT ONE was a dud. Not one. The best part? The folks here are incredibly knowledgeable about exterior illumination but also patient. I had the privilege of speaking with Dave and he truly made me feel prepared to take our Christmas display to the next level. These bulbs did just that. I will be ordering from these folks again. The bulbs are fine but I ordered 4 boxes of 15 for a light string that hplds 100 bulbs. 4 of the bulbs are broken. I don't know if this happened in shipping or at the warehouse but it still leaves me 4 bulbs short. Guess I should have ordered 5 boxes. Note from Shellie: When we saw this review we contacted Stephanie and sent her replacements for the broken bulbs. Q: Will these bulbs fit into my C9 cords? These bulbs fit into any standard C9 cord. The base size is also called intermediate and the specification is E12. So if you have a cord that has E12 or intermediate sockets that you've used with the larger C9 bulbs, you should be just fine. When you are installing your bulbs, give them a quarter counter-clockwise turn to keep them from cross threading.